1. Prepare the sauce in the base of the slow cooker by stirring together the olive oil, diced tomatoes, tomato paste, broth or water, mushrooms, onions, garlic cloves, Italian seasonings and salt and pepper. 2. Add the chicken thighs to the sauce in the slow cooker and spoon over the sauce on top of the chicken thighs. Set the slow cooker on low and cook for eight hours. 3. Just before the chicken is finished cooking, prepare the fettuccine or linguine noodles as directed on the package. 4. 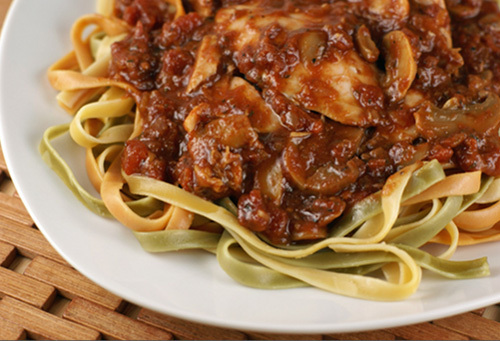 Serve the chicken cacciatore over top of the noodles, with a side salad or vegetables. 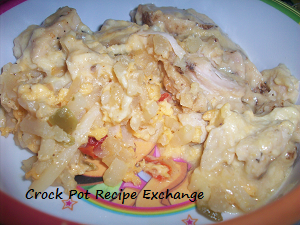 This recipe shared at Potluck Sunday, Full Plate Thursday and Foodie Friday.